The first engagement of the American Civil War took place at Fort Sumter on April 12 and 13 of 1861. After 34 hours of intense fighting, the Union forces surrendered the fort to the Confederate army. From 1863 to 1865, the Confederates at Fort Sumter withstood a 22-month long siege by Union troops. During this time, most of the fort was reduced to little more than rubble. Returned to Union hands in 1865, she resumed her role in the coastal defense system until 1948, when the fort became a national monument. This medallion, referred to as the 'Fort Sumter Confederate War Centennial Medal', was produced in 1965. On the front, it shows the South Carolina State Flag, as well as the Confederate Naval Jack, and states of years of the centennial. On the reverse, the medallion shows a sketch of Fort Sumter, and displays the years of it's use by both the Union (1828-1861 & 1865-1961) and Confederate (1861-1865) forces. It also states that "This Commemorative Medal Contains Actual Metal Recovered at the Fort". From 'Whirlaway', 'Citation', and 'Secretariat' to 'Affirmed', 'Alysheba' and 'Go for Gin', these Derby champions have all achieved their places in history by being to first across this finish line on the way to claiming the coveted garland of roses. Technology has rendered the finish line obsolete. This line was removed from Churchill Downs on October 12, 1994. 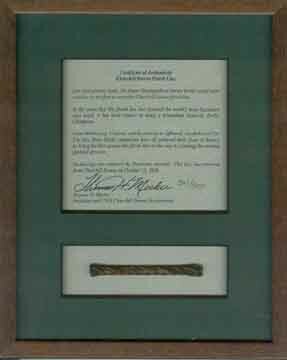 The certificate of authenticity is sign and numbered (361 of 500) by Thomas H. Meeker, the President and CEO of Churchill Downs Incorporated. The display is matted and is a 8 1/2" by 11" wooden frame. The line segment is about 4 inches in length, and about a quarter inch in diameter. It is made of strung metal with an orange interweave. This piece of historic marble was once part of the United States Capitol Building in Washington, DC. Originally part of the marble steps to the East Front of the House wing, this stone was installed as part of the massive Capitol Extension Project in the mid-nineteenth century. 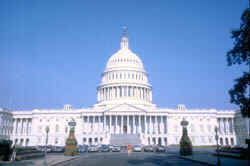 Every member of the House of Representatives sine has trod these steps leaving footprints in history. The worn marble East Front steps to the House wing were removed in 1995 and the U.S. Capitol Historical Society was permitted to use a portion of the removed marble to create this historic piece. 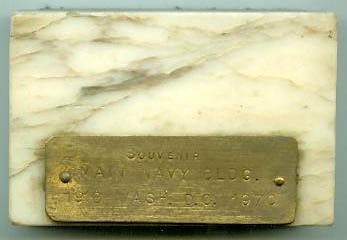 Mounted on a handcrafted walnut base, measuring 4 inches square, the marble is a slice of the original steps of the East Front of the House of Representatives wing of the Capitol laid between 1863 and 1865, and has a medallion impressed upon its face, as well as includes with it a letter of authenticity. Throughout the world, the Twin Spires are a recognized landmark that has become symbolic to Churchill Downs and "the greatest two minutes in sports", the Kentucky Derby. Constructed in 1895, the Spires were the creation of a twenty-four-year-old draftsman, Joseph Dominic Baldez, who was asked to draw the plans for Churchill Downs' new Grandstand. Originally the plans did not include the Spires, but as the young Baldez continued work on his design, he felt the structure needed something to give it a striking appearance. Described as towers in the original drawing, the hexagonal spires exemplify late nineteenth century architecture, in which symmetry and balance took precedence over function. Although Baldez designed many other structures in Louisville, the Twin Spires remain as an everlasting monument to the architect. Former Churchill Downs President Matt J. Winn is reported to have told Baldez, "Joe when you die there's one monument that will never be taken down, the Twin Spires." From 2001 to 2005, Churchill Downs underwent a three-and-a-half year, $121 million renovation. 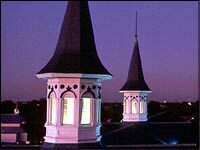 The clubhouse was replaced, 79 luxury suites were added, and the historic twin spires were refurbished. This wood is a product of that refurbishing. 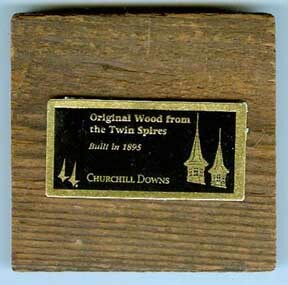 Measuring 4" x 4", it has stood witness to the numerous races and derbies Churchill Downs has been the venue of. For more than five decades, the "Main Navy" and "Munitions" Buildings dominated the scenery along Constitution Avenue west of the Washington Monument, in the Northwest quadrant of Washington, D.C. Erected in 1918 as "temporary" office buildings to support the vastly expanded World War I military, they were so spacious and useful that it required a 1970 Presidential command to force their demolition. Main Navy and Munitions were first occupied in August 1918, a few months before the end of the "Great War". They held some 14,000 Navy, Army and Civilian personnel when the fighting ended. Among their inhabitants were the Secretary of the Navy, the Chief of Naval Operations and their staffs. The Navy's high command remained there until after World War II, when it was transferred to the Pentagon. At the end of their long careers the two buildings were home to most of the Navy's material systems commands, and their abandonment helped to fill a good many new office buildings in nearby Northern Virginia. Also in residence were the Navy Department Library and much of the rest of what is now the Naval Historical Center. These two structures were very large and heavily-constructed, if not especially beautiful. Their fronts stretched for nearly a third of a mile down Constitution Avenue's south side, from 17th Street to 21st. A vehicle entryway at the foot of 19th Street separated the buildings. Main Navy had a large pedestrian entrance at the foot of 18th Street, while the Munitions Building's main entrance was at the foot of 20th. Their street facades were three stories high, with long east-west main corridors that branched at regular intervals into north-south wings, eight for the Munitions Building and nine for Main Navy. In the early 1940s, with the needs of World War II looming, the latter had an architecturally similar tenth wing constructed at its eastern end, while roughly-built fourth floors were grafted to the tops of all the wings. Other "wood and beaverboard" temporary buildings were erected behind the two structures and between some of the wings. Much local controversy accompanied Main Navy's and Munitions' presence on what had been park land, and there was constant agitation for their removal. But they outlasted nearly all of the City's once-vast number of wartime "temporaries". Even when President Nixon ordered their end, most of the occupants greeted the news with a skepticism born of long experience. However, as warm weather arrived in 1970, so did a regular procession of moving vans, followed by wrecking crews. By year's end, the buildings were largely reduced to rubble. Their site is now occupied by Constitution Gardens park, with the Vietnam Memorial resting near the western end of what had once been the Munitions Building (Text Source: Naval Historical Center). Some of the marble from this historic building was saved, and processed into souvenir paperweights, as seen above.